Jack O'Brien was born Marcelo Andreani in Houston, Texas on February 18, 1910. He grew up in an Italian-Mexican family with resources, which ended up moving to Mexico where he studied to be a dental surgeon. He was also a baseball player. His position was an outfielder and he was good enough to pursue a pro career but he chose to dedicate all of his efforts to studying instead. With no interest in being a professional, he quit baseball and trained on the track and field team. At 166cm, he was quite short but he was best at the pole vault, for which he apparently held the Mexican national record until Rigoberto Pérez beat it. He was also part of the Puma team, formed by men in the dental business, where he was a swimmer. O'Brien was a very complete athlete and was a top guy when he became a wrestler. His rise to stardom was quick, as he didn't have a big frame but had a very athletic build, and he was, by all accounts, a very good worker. At this point he had Mexican citizenship, so in 1934 he beat Dientes Hernández with a "Tirabuzón", (Corkscrew; Mexican version of the abdominal stretch, which is credited as his invention), in the finals of a tournament to become the first National Lightweight champion. O'Brien was one of the company's headliners of the era and he defended his title in main events against challengers like Carlos Meza (May 3, 1937), until losing to Dientes Hernández on June 28, 1937. He regained the championship in May, 1938 but even without it he remained one of the company's top stars. On September 22, 1938, he headlined the company's 5th Anniversary show at Arena Mexico, losing in a "super libre" match to Pete Pancoff after a year long feud. The semi-main event for the show was Tarzán López over Joaquín Murrieta. O'Brien, whose weight was around the 82kg. range, graduated to the hotter welterweight division where most of the country's new stars were competing. He beat Lobo Rubio, who would later gain fame as a movie villain, in April, 1942 to capture the National Welterweight belt which he vacated two months later. Jack had a fantastic rivalry with Santo and Gori Guerrero, the "Pareja Atómica" (Atomic Team). It was actually O'Brien who saw Rodolfo Guzman Huerta wrestling in Pachuca as Ruddy Guzmán. He saw something special in the young kid, and recommended him, and brother Miguel "Black" Guzmán, to referee Jesús "Chucho" Lomelí, who was the Empresa's talent scout at the time. O'Brien beat El Santo on February 18, 1944 to win the National Welterweight belt. Santo gained retribution on April 8 when he defeated him in a "máscara contra cabellera" (mask vs. hair) match but he never could take the belt from him. On November 19, 1944, Santo and Guerrero teamed together for the first time and literally wiped out the ring with Bobby Bonales and Jack O'Brien, in a match as one sided as they got at the time. Commentator Toño Andere said that the new unit was such a destructive force that he called them "La Pareja Atómica" and the name stuck with them. On February 23, 1945, Santo and Gori beat Tarzán López and O'Brien in a major match, and a bit later, on April 20, Gori Guerrero defeated O'Brien for the Welterweight belt. Years later, he would defeat El Santo again to become the second NWA World Welterweight champion in history. This was his revenge as he had participated in the original title tournament that Santo won, (defeating Pete Pancoff in the finals), losing against Santo himself in the semi-finals. O'Brien held this title from February 14, 1947 until April 29, 1949, eventually losing it to Gori Guerrero. Another of his career highlights was his team with Rito Romero, which was short-lived but very well remembered by the most loyal fans of the era who nicknamed them "La Pareja Perfecta" (The Perfect Team) due to their split-second co-ordination on the execution of tag team moves. By this time O'Brien was also working a lot outside of Mexico, especially in the Texas area, where he was nicknamed "Roughhouse". He worked a few main events in Dallas. At the same time in Ohio, a wrestler named The Demon, whose real name was Jack O'Brien, held the Ohio version of the World Heavyweight title but they are not the same man, as this wrestler weighed around 280lbs. From 1952 to 1953, he appeared in three films, "Huracán Ramírez", "El Enmascarado de Plata" and "La Bestia Magnífica". The latter has often been referred to as the lucha libre film with the best quality matches in it. In the Huracán film he was not only a performer but a technical adviser as well. 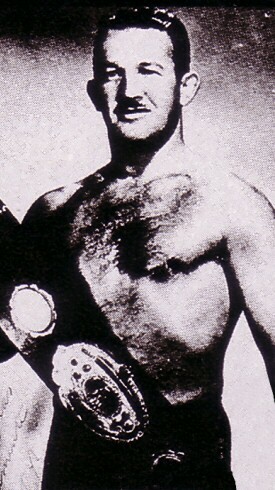 O'Brien, along with Bobby Segura, also took part in scouting a new young wrestler to play the Huracán part in later movies after Eduardo Bonada quit. They found Daniel García, who is the man who made the gimmick such a successful business draw for decades. Also in 1952, he became a promoter, leaving EMLL for the new Televicentro promotion which was run by successful Northern promoters, Jesús "Chucho" Garza Hernández and Jewish-Mexican Elías Simón Kuri. This was the first time in history anyone had opposed the Lutteroth empire. It's quite a coincidence that 40 years later something similar happened with AAA. Televicentro, now Televisa, had deep pockets to pay for the costs and wages of the new promotion, and they gave them the benefit of TV. It's scary how similar to AAA this project was, as they took some wrestlers from EMLL (although, not the biggest stars) and pushed a weird but successful combination of great workers and gimmicky non-workers. Either way, the final result was a disaster, as Mexico City Mayor, Ernesto P. Uruchurtu, eventually banned wrestling from TV due to it being "noxious for the children". The decision came after the publicized death of a child who had died while trying to imitate Black Shadow's "tope en reversa". After the promotional fiasco, things were patched up between O'Brien and the Lutteroth family. He retired as an active wrestler in 1956 but he worked for some time as the manager of Arena Coliseo in Acapulco, Gro. and Arena México in Mexico City. He retired this post when he took a prestigious government job in Cuernavaca, Morelos. The governor of Mexico state at the time was Dr. Jorge Jiménez Cantú, who had been a fellow student with O'Brien many years earlier at the University of Mexico. Through this connection, Jack was also able to gain another preferred position in Toluca, Mexico State. He shortly came out of retirement in the late 60's to work a few bouts under the Dr. O'Brian (sic) mask and name, teaming up on the independent scene with the original Dr. O'Borman. Eventually he moved to the Mexico/Texas border town of Cd. Juárez, Chih. to take a job as the Doctor of the local wrestling commission, which he held during three, six year terms. After that, he retired completely and died on September 14, 1982.